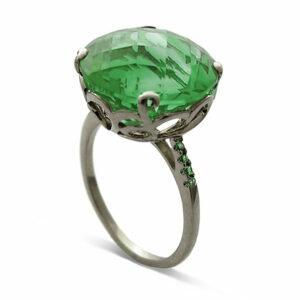 The warm and cool tones of the Shooting Star Collection is depicted by the metal and stones. The vein of 8 hearts and 8 arrows cubic zirconia leading towards the luminous pear-shaped stone denotes the movement of the glowing, burning rock as it trails through the night sky. 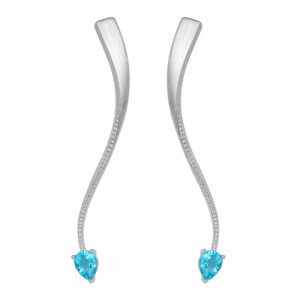 This sleek long earrings come available in two finishes – brushed white rhodium plated with blue topaz, purple amethyst or peridot. Also available in polished 18ct yellow gold plated with citrine or garnet. Star of Love North Star semi tennis bracelet with blue topaz and white cubic zirconia, set in white rhodium plate on sterling silver. 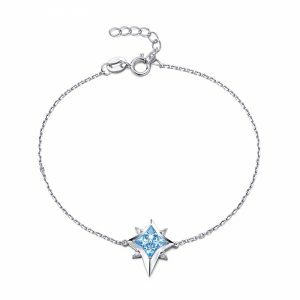 Star of Love North Star bracelet with blue topaz and white cubic zirconia, set in white rhodium plate on sterling silver. 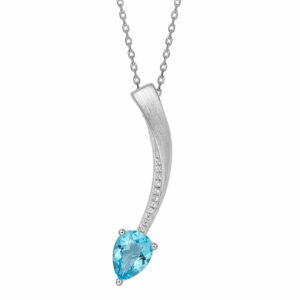 Star of Love Mini Star pendant with blue topaz and white cubic zirconia, set in white rhodium plate on sterling silver. 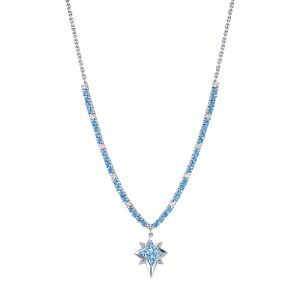 Star of Love North Star necklace with blue topaz and white cubic zirconia, set in white rhodium plate on sterling silver. 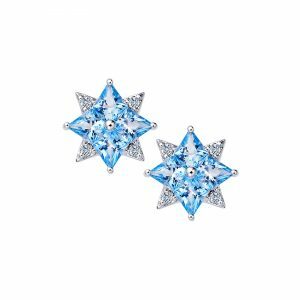 Star of Love Mini Star earrings with blue topaz and white cubic zirconia, set in white rhodium plate on sterling silver. Star of Love Mini Star ring with blue topaz and white cubic zirconia, set in white rhodium plate on sterling silver. 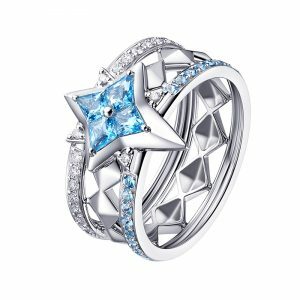 Star of Love North Star large ring with blue topaz and white cubic zirconia, set in white rhodium plate on sterling silver. Star of Love North Star ring with blue topaz and white cubic zirconia, set in white rhodium plate on sterling silver. The warm and cool tones of the Shooting Star Collection is depicted by the metal and stones. The vein of 8 hearts and 8 arrows cubic zirconia leading towards the luminous pear-shaped stone denotes the movement of the glowing, burning rock as it trails through the night sky. 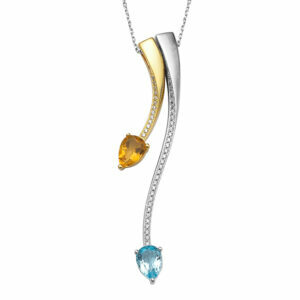 This sleek high polished choker comes available in white rhodium plate with blue topaz or purple amethyst, or in 18ct yellow gold plate with citrine. The warm and cool tones of the Shooting Star Collection is depicted by the metal and stones. The vein of 8 hearts and 8 arrows cubic zirconia leading towards the luminous pear-shaped stone denotes the movement of the glowing, burning rock as it trails through the night sky. 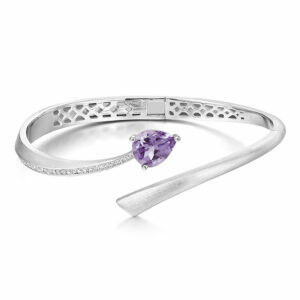 This sleek two stone bangle comes available in two finishes – brushed white rhodium plated with blue topaz, purple amethyst or peridot. Also available in polished 18ct yellow gold plated with citrine or garnet. The warm and cool tones of the Shooting Star Collection is depicted by the metal and stones. The vein of 8 hearts and 8 arrows cubic zirconia leading towards the luminous pear-shaped stone denotes the movement of the glowing, burning rock as it trails through the night sky. This sleek single bangle comes available in two finishes – brushed white rhodium plated with blue topaz, purple amethyst or peridot. Also available in polished 18ct yellow gold plated with citrine or garnet. The warm and cool tones of the Shooting Star Collection is depicted by the metal and stones. The vein of 8 hearts and 8 arrows cubic zirconia leading towards the luminous pear-shaped stone denotes the movement of the glowing, burning rock as it trails through the night sky. 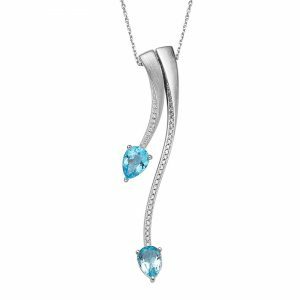 This sleek long pendant comes available in two finishes – brushed white rhodium plated with blue topaz, purple amethyst or peridot. Also available in polished 18ct yellow gold plated with citrine or garnet. The warm and cool tones of the Shooting Star Collection is depicted by the metal and stones. The vein of 8 hearts and 8 arrows cubic zirconia leading towards the luminous pear-shaped stone denotes the movement of the glowing, burning rock as it trails through the night sky. This sleek short pendant comes available in two finishes – brushed white rhodium plated with blue topaz, purple amethyst or peridot. Also available in polished 18ct yellow gold plated with citrine or garnet. The warm and cool tones of the Shooting Star Collection is depicted by the metal and stones. The vein of 8 hearts and 8 arrows cubic zirconia leading towards the luminous pear-shaped stone denotes the movement of the glowing, burning rock as it trails through the night sky. This sleek two-way wear earrings come available in two finishes – brushed white rhodium plated with blue topaz, purple amethyst or peridot. Also available in polished 18ct yellow gold plated with citrine or garnet.